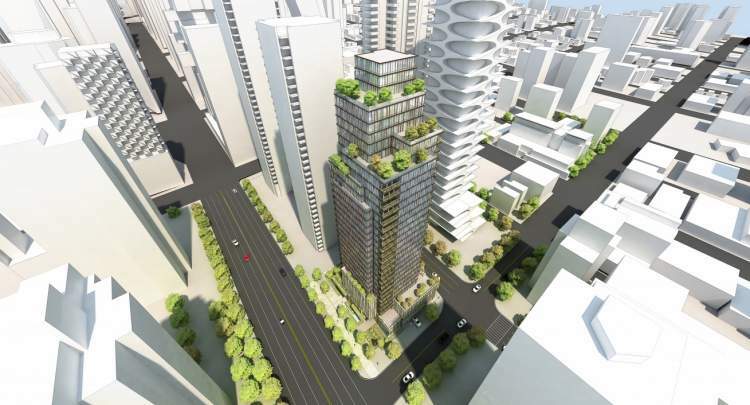 Anthem Properties has submitted a development application to build a prominent 33-storey residential tower at the southeast corner of West Georgia and Bidwell streets. 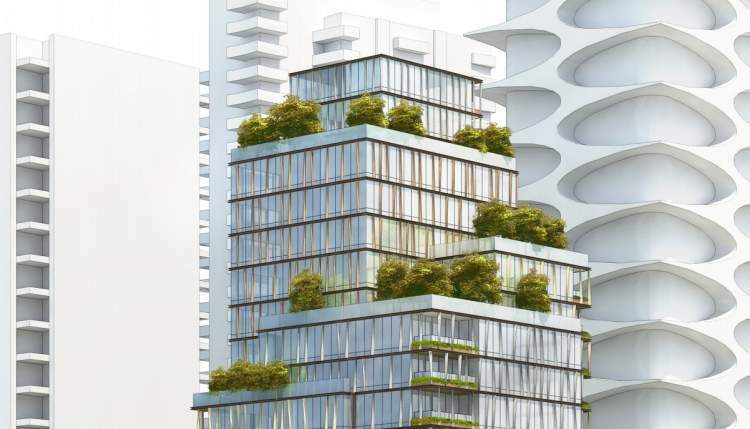 The team of Kohn Pedersen Fox Architects and Chris Dikeakos Architects have proposed a design inspired by the balance between boldness and subtlety of the mountains, aiming to bring a sense of nature to the convenience of urban living. Interlocking and stepping, the dynamic composition of the tower strongly portrays the character of mountainous rocks. Cascading greens on the upper terraces continue down on the tower facade before spreading out to the podium terraces, then to the ground level landscaping, depicting mountain foothills. 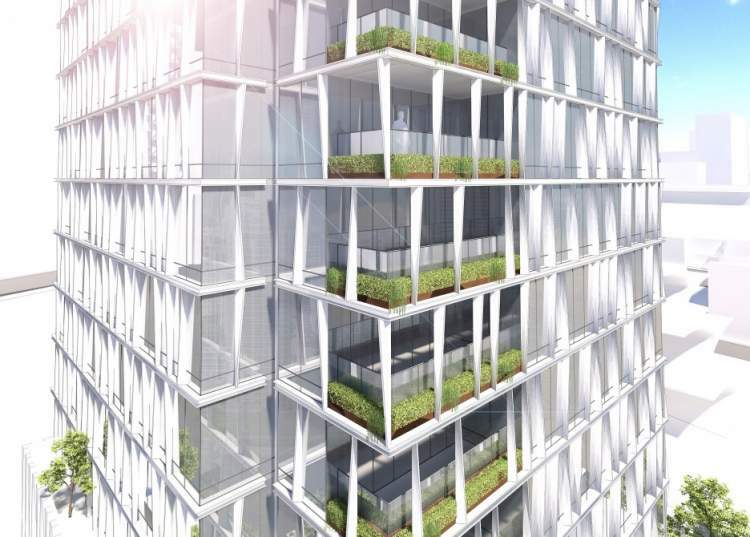 A total of 127 market residences will be offered. This project is in its development application stage. Details can change. Sign up to our VIP list above for priority access to 1698 West Georgia updates. Off the lobby will be a 1,625 sq ft gym with an adjoining patio. 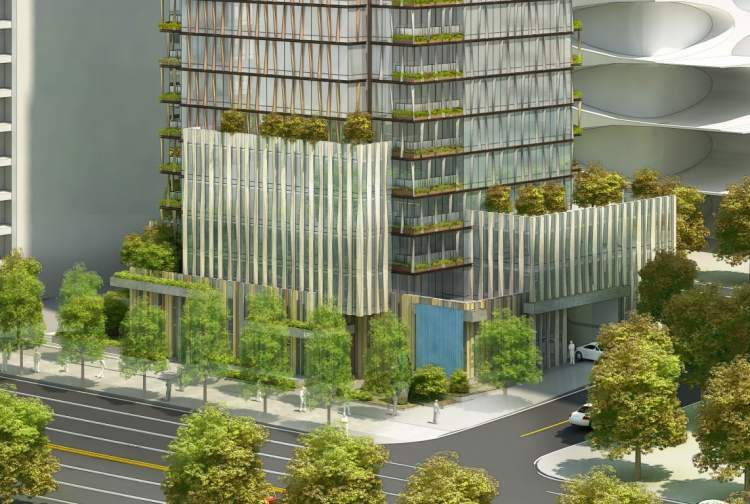 On the 6th floor, residents will enjoy shared use of a 930 sq ft multi-purpose room with a 910 sq ft roof deck. At the lower podium, a 2-storey waterfall fed by recycled storm water is not only a prominent visual element, but will also generate white noise to block out the sounds of traffic. A total of 335 bike stalls and 213 vehicle parking spaces will be located in a 6-level underground parkade. Of the latter, 6 are for visitor and 5 for accessible parking. Racks for 7 bicycles will be available for short-term parking at grade. Loading/unloading will be accommodated by two Class A and one Class B loading bays. Founded in 1991, Anthem Properties is a real estate development company focused on investment, development, and management of commercial and residential properties. Their growing residential portfolio includes more than 10,000 homes that are complete, in design or currently under construction â€“ from master-planned, mixed-use residential and multi-family to townhome and single-family communities. Long before breaking ground, Anthem invest heavily in a rigorous process of research, planning, and due diligence to ensure a successful outcome. Kohn Pederson Fox is a unified architectural practice focused on the design of buildings of all types and scales, in all geographic regions. The firm consists of over 650 staff led by 30 principals, with offices in New York, London, San Francisco, Shanghai, Hong Kong, Seoul, Abu Dhabi, Berlin, and Singapore. Their projects include the world’s tallest towers, longest spans, most varied programs, and inventive forms. The goal that binds KPF’s work – and what motivates their efforts – is finding the smartest solution for each project. KPF believes that the best design is the product of an open-minded search, one without preconceptions or stylistic formulae.